Have you seen the photos of Yosemite National Park? They’re incredible. Sweeping views of mountains, gorgeous waterfalls and luscious sequoias dot the landscape. Before our visit, we eagerly checked out park information and ranked the trails we wanted to check out based on reviews and photos. 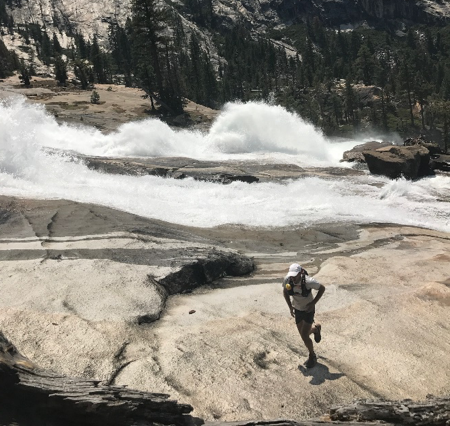 For our long run, we decided to tackle a portion of the Glen Aulin Trail which led to Waterwheel Falls, approximately 18 miles roundtrip. Frank was exhausted from constant climbing and begged me to consider something which didn’t involve summitting another mountain. 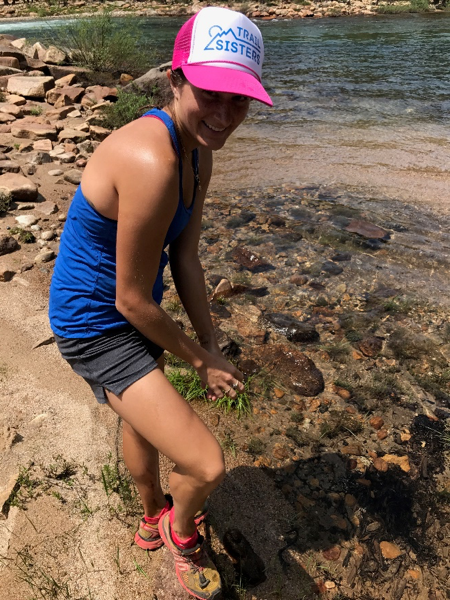 The trail varied between pine needle beds, stone stairs and dirt paths. It wasn’t extremely technical, though we both wore trail shoes with moderate lugs in case. I wouldn’t recommend road shoes, nor anything with too much lug unless you’re heading out during spring when the snow is melting. We chose this route over some of the more popular options since they require permits. You read that correctly. 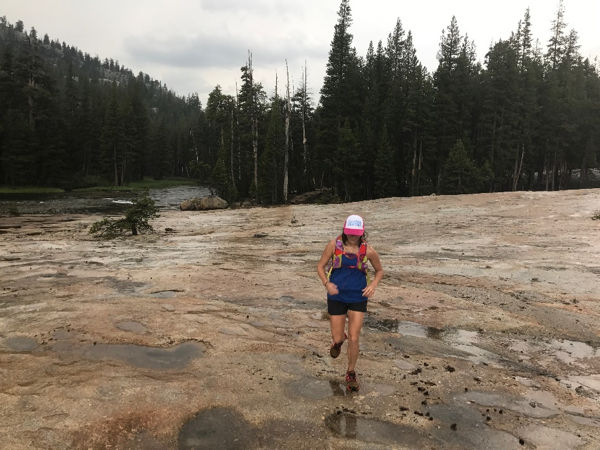 You need to secure a permit to run some of the most popular routes in Yosemite National Park. If you’re planning a visit and have your heart set on one of these routes, put in for it early. The park begins issuing permits 24 weeks in advance. Approximately 40% of the permits are kept open for walk-ins. You can purchase these on a first come, first served basis at 11 a.m. the day before your hike. We didn’t feel like wasting a day waiting in line for a permit, so we just selected another route. Many visitors stay towards the western side of the park and near the more popular features. We opted to visit the park’s eastern trails which were conveniently located near the Inyo National Forest. We camped for several nights in the Inyo National Forest at a trailhead, which has loose dispersed camping restrictions. Yosemite, like Yellowstone, has a strict policy for overnight dirtbagging. 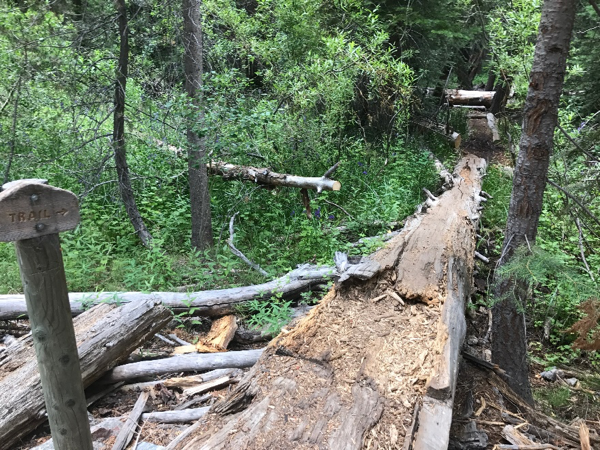 Fortunately, if you have a permit for a trailhead, the park permits you to stay one night before and one night after your planned run in a special backpacking campground. This way, you can avoid the long trek outside of the park and make the most of your time on the trails. Without a permit, you’ll need to reserve your campground months in advance or try to grab a first come, first served spot. These fill up quickly, so have a backup plan in case. Backcountry permits are available as well, but these are expensive and go quickly. Parking fills up fast at trailheads in Yosemite. We arrived at 7 a.m. to eat breakfast before heading out. An hour later, the trailhead was already full. Folks started parking along the street and in a nearby visitor center. As we made our way towards the western side of the park, parking became significantly more scarce. We didn’t notice many folks along the trail. In ~20 miles, we encountered around 15 other groups. On our second outing in the western section of the park, the trails were so packed we didn’t even bother trying to run. Our route fortunately offered streams to cool off in. If you use a portable filter, you’ll be able to take advantage of the fresh water sources. We began our run near the top of the waterfall and followed it to the base. We didn’t pay attention to the old adage, what goes down must come up. I could feel Frank’s eyes boring a hole into my back for a good portion of our slog back. Unfortunately, we didn’t move quick enough on our way back and got caught in a massive afternoon hail storm. We couldn’t find adequate shelter and decided to keep running until we made it out of the danger area. Luckily, the storm hit when we were only a few miles away from the truck. Needless to say, we picked up the pace quite a bit. During the storm, the temperature dropped considerably. My teeth were chattering when we got back – I made the rookie mistake of leaving my extra layer and waterproof jacket in the truck. Afternoon storms are notorious in high altitude areas. If you’re venturing above the tree line, this can be especially dangerous since you’ll be more exposed to lightning strikes. Pack warm layers and start your run early to avoid being stranded. Bear rules apply in Yosemite as well. Brush up on bear guidance and plan accordingly with your food. Apparently, the bears here like to rip off car doors to reach human treats locked inside. Keep your food locked in bear proof containers to avoid losing your vehicle. It’s possible to get extra snacks and supplies at convenience stores within the park, though prices are expensive compared to other local grocery stores. Stock up on what you need before you enter the park to save some cash. California is one of the few states which still has instances of the bubonic plague, though they are rare. I sprayed our shoes and socks with bug repellent to deter fleas and critters from coming too close. The actual documented cases of the illness are few and far between, though it’s probably best to visit a doctor if you begin to experience flu-like symptoms after your visit. Yosemite is a large park with a plethora of unique features. To take it all in, you’ll need to plan on staying for more than just a few days. The park’s busiest times are during the summer months. If you’re interested in a winter or offseason visit, you’ll have an easier time obtaining permits for trailheads. You’ll also have to contend with cooler weather and closed roads as well. For additional information, check out the National Park Service’s Yosemite website. 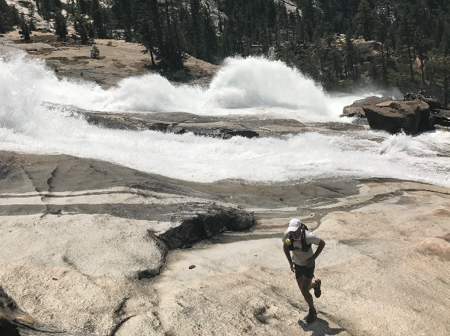 Yosemite is an incredible park for running! There’s one point that should be corrected in your article. The Half Dome Trail is the only trail in the park that requires a permit for a day trip. 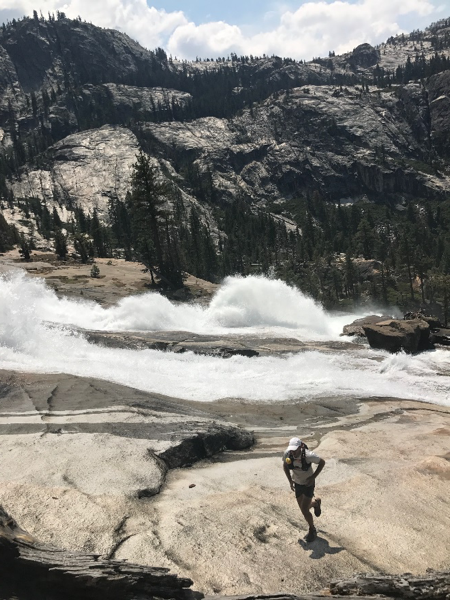 Wilderness permits are required for all overnight trips, but any other trail in the park can be run without a permit, as long as you’re not stopping to spend the night on the trail. Hi Mark, thank you for the clarification! I misread the park information, I appreciate you pointing out the correction.